Carlo Mazzone-Clementi was a contemporary and colleague of the giants of modern European theater. He first gained attention in Italy in 1947 when he worked alongside Marcel Marceau in the mime’s first tour outside of Paris. From 1948 to 1951, he assisted the master of movement, Jacques Lecoq, while Lecoq taught and directed the Players of Padua University. In 1954, Mazzone-Clementi was in the Piccolo Teatro di Milano with Dario Fo and Franca Rame. Their young Italian company was on the forefront of the renaissance of Italian theatre in the ’50s. While he was performing with Piccolo Teatro, the American theatre scholar and director Eric Bentley came to Italy to direct the company in the first Italian production of Bertolt Brecht. Then, with Bentley’s patronage, Mazzone-Clementi toured the United States in 1958, conducting workshops in mime and commedia, and introducing the leather masks of Amleto Sartori to American audiences. That led to a teaching assignment at the Carnegie Institute of Technology (now known as Carnegie-Mellon University) and to similar work in colleges and universities around the States. 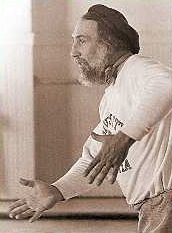 In 1973, Mazzone-Clementi and his wife Jane Hill, a graduate of Carnegie-Mellon, went to Humboldt County where Hill had a teaching position at College of the Redwoods. Together they put on the Grand Comedy Festival at Qual-a-wa-loo and Mazzone-Clementi served as the festival’s artistic director for six years. In 1974, the couple purchased the Oddfellows Hall in Blue Lake, Callifornia and co-founded the Dell’Arte School of Mime and Comedy (now known as the Dell’Arte International School of Physical Theatre).